Rodney Dangerfield is a cultural icon. Even those not overly familiar with his standup comedy work on television and in film would recognize his face. And his distinctive voice is quite memorable, as is his most famous quip (“I don’t get no respect!” or some variant of that phrase). Yet Dangerfield released only about a half-dozen comedy albums over the course of his career. In 2008, Shout! Factory released Greatest Bits, a compilation that purports to be just that. The five tracks–three of which are quite lengthy–actually span only the period 1966 to 1983. The selection of tracks is seemingly haphazard, possibly driven more by what was available for licensing rather than what best conveyed his unique talents. Still, the material is funny, if dated. The best routines on the disc are live club dates, where Dangerfield’s rapid-fire gags build from a slow sequence to a nonstop barrage over the course of ten minutes or so. The man had near-flawless timing; the style of the jokes don’t really change over the course of a routine, but the rate of their delivery does. And that timing is a big part of what made Dangerfield special. His delivery was best suited for standup gigs, though it worked well in films like Easy Money, Back to School and Caddyshack. 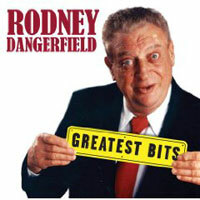 The references to cocaine use and homophobic jokes don’t translate well to the 21st century, but it’s important to remember that (on the disc’s standup routines) Dangerfield was working in ’66 and ’80, and that most adult audiences in those times wouldn’t have found those gags especially offensive. The inclusion of the songs “Rappin’ Rodney” and “Finiculi Finicula” might have seemed essential to the compilers of the disc, but on listening they do little more than impede the album’s flow. “Rappin’ Rodney,” in particular might have seemed like a good idea at the time of its 1980 release, but shoehorning Dangerfield’s shtick into a rap format doesn’t really work, and not for cultural reasons: the rigid beat structure of rap doesn’t allow for the pace acceleration critical to Dangerfield’s delivery. The two music tracks are placed at the tail-end of the disc; most listeners will enjoy the first forty minutes or so and then stop the disc. Ultimately, though, in the absence of any other career-spanning survey of Rodney Dangerfield’s work (and considering the rarity of his 1966 standup LP, this album is a welcome find. And with it, Dangerfield does in fact get some measure of the respect he craved.